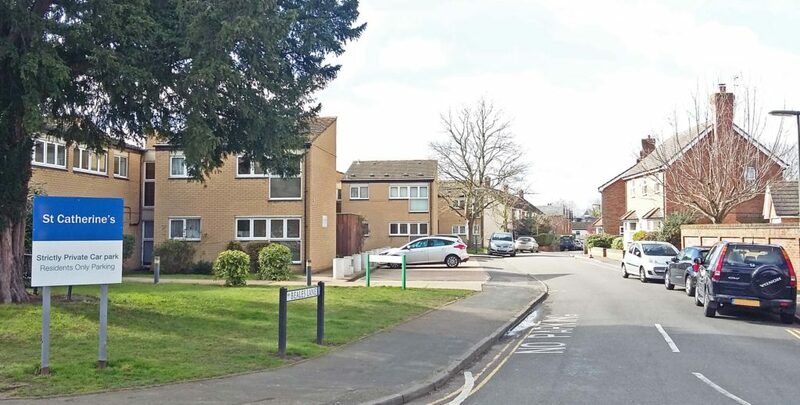 Plans for a three storey block of 17 flats and 11 houses in Beales Lane, with 53 bedrooms, are being considered by Elmbridge Borough Council (application 2019/0386). Over 100 objections have been registered with Elmbridge. Read our PPDRA letter here. The new block would replace the existing St Catherine’s buildings (lacking merit but inconspicuous, total 27 bedrooms) with a significantly taller block, of more than twice the mass, with its bulk much closer to the road. See the photo and plans above to get a feel for the proposed scale. It is 55% higher from ground to rooftop compared with present, towards the Thames St end. The plans propose parking spaces for 28 cars behind the block, accessed via a height-limited entrance mid-building. The style of the proposed building is quite unlike other properties in north Weybridge. Some residents feel strongly that it is wrong for the location. Many are concerned about the excessive bulk, and negative impact of the proposed development on the streetscene, traffic and parking – that it would transform the character of Beales Lane, and not in a good way. Residents are worried that the character of Beales Lane will be lost. Beales Lane is green and open towards its Thames Street end. The St Catherine’s buildings are low and mostly set well back. Their layout is staggered so it doesn’t impose. The houses opposite are a traditionally styled 1998 development, in keeping with the character of Weybridge. It is currently a pleasant suburban lane, leading to the historic small cottages of Church Walk. The new building would present a much larger and more dominating profile along its length, and project closer to Thames Street. It would be a massive difference. Below we list some objections to the development plans, raised by local residents. Its bulk and mass would be excessive for this suburban site. Neighbouring residents are concerned that the proposed high building will block their light. Some question the measurements supplied in the application, for the height of windows opposite. The number of people who comment is crucial to the future of Beales Lane and Church Walk. Search for 2019/0386 at www.elmbridge.gov.uk/planning. Comments to Elmbridge BC are invited by 29 March, but will be accepted after that. Use the comment form on the EBC website or email tplan@elmbridge.gov.uk. The application will be considered by councillors on Elmbridge Borough Council South Area Planning Sub-committee. Traffic and parking issues are the responsibility of Surrey County Council, who will prepare a consultation report in relation to planning application EBC 2019/0386. Flats or Flats & Houses? 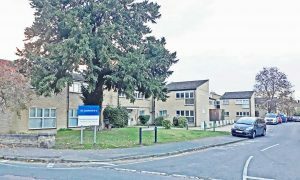 Some residents are puzzled by the reference to 17 flats and 11 houses in the planning application, when the drawings appear to show a single large block of flats, arranged over three floors. Proposals to replace Bridge House (opposite Waitrose) with a much taller and more massive building are facing strong objections. Planning Application EBC 2018/2989 – Bridge House, 41-45 High Street, seeks to replace the current three storey building with a far bigger five storey rectangular building, housing three retail units and 28 flats. The site is next to the Monument Green Conservation Area, and the new building would dominate the streetscene in a very different style. Onsite parking would be reduced to 20, and the 28 flats would have to share 17 spaces, risking severe loss of nearby on-street parking amenity in an area already under great parking stress. The three retail units would each have one space. Central Weybridge has attractive conservation areas, with some lovely buildings at either end of the High Street, separated by a mix of traditional gabled buildings and the results of some poor quality post-modern planning of the 1970s. Bridge House is one of those 1970s buildings. It sits next to Monument Green Conservation Area, and is visibly out of keeping. Thankfully it is low enough not to dominate entirely, but it has little else to commend it, and some people think it is an eyesore because of its vertical and angular style. Many residents hope that any redevelopment of the 1970s mistakes would be more in sympathy with the character of our historic Weybridge townscape. There is a real opportunity with any redevelopment in Weybridge High Street to create new buildings which are in harmony with the traditional setting. This application fails to take that opportunity. Instead it tries to cram the largest mass of building it can seek to justify, into a constrained site, regardless of the negative impact. The current application would dominate and detract from the charm of the Conservation Area, and be detrimental to the streetscene. The proposed new five storey building would be over 50% taller than the current three storey Bridge House (reaching up to the label in our picture above), and would stand out far more prominently next to the Conservation Area. The streetscene plan shows it alongside its neighbours, and the contrast in bulk, mass and height. Comments to Elmbridge Borough Council are invited by 14 Dec, but will be accepted at tplan@elmbridge.gov.uk after that. The application will be considered by the planning sub-committee at some date in the new year. I am writing on behalf of the committee of Portmore Park & District Residents Association to object to the proposed construction of a five storey building comprising 3 retail units and 28 flats. The proposed building is massive. At five storeys, it would dwarf its neighbours and tower above the Monument Green Conservation Area. The building’s appearance would be entirely at odds with the traditional buildings in the High Street and conservation area. It offers no architectural nod to the predominant traditional local architectural styles. People are asking if it was inspired by a multi-storey car park. Surely a new building in this prominent site should take the opportunity of complementing its surroundings? The strong horizontal and vertical elements of the proposed development would overwhelm its neighbours’ historic brick, slate and gables. It would loom over the southern part of the conservation area, and would dominate the view from the north. This suggests that with 9 two bed and 19 one bed flats there should be 33 spaces (9 x 1.5 + 19) for the residential units, rather than the 17 proposed. Yet this application proposes reducing total number of parking spaces on the site from 28 to 20, while greatly increasing the number of residential units. The roads adjacent to Weybridge High Street face what some residents describe as a worsening parking crisis, as successive new infill developments and changes to residential use have been permitted by Elmbridge with limited or no parking provision. These roads include a lot of Victorian/Edwardian homes, with relatively narrow frontages and with limited or no off-street parking. Hence many residents have to rely on being able to find somewhere to park on the street. That has become increasingly difficult. Surely Elmbridge Borough Council, as our town planning authority, should be working to improve the amenities of local residents, rather than adding to problems? We sincerely hope that after considering Application 2018/2989, Elmbridge Borough Council will refuse this application, because with its excessive height, bulk and mass the building would dominate the street scene, with negative impact on views from and towards the Conservation Area, and because its adequate parking provision would cause additional on-street parking stress detrimental to the amenities of residents, failing to comply with acceptable standards. Is your road used by rat run traffic? Are there parking issues in your road? Or is everything fine as it is? If the answer to any of these is ‘yes’, and you live in north Weybridge, please join in our survey. PPDRA is gathering information about traffic and parking in our residential roads, and how they affect residents. Your experience, good or bad, is what matters! (you can skip questions if they are not relevant to you). Your experience of traffic and parking in your road can help inform future local Council decisions. All personal information will be kept confidential, and any reports will not identify individuals. Online completion of the survey is preferred, as the results are automatically calculated. 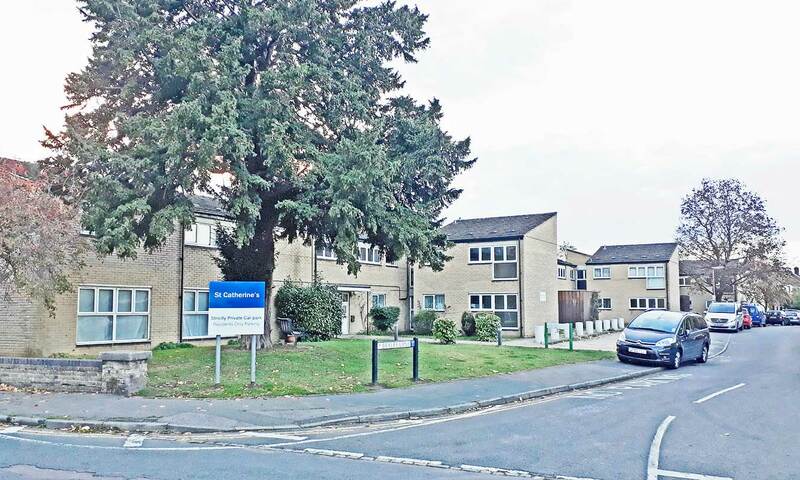 Weybridge residents viewed plans to develop St Catherine’s House in Beales Lane, at a community consultation on 15 November. 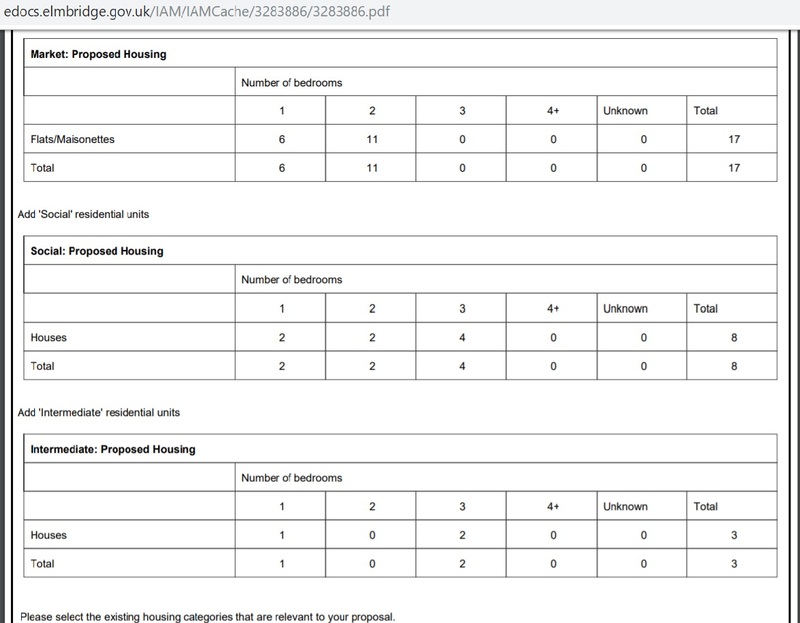 We saw plans for 30 flats, comprising 1, 2 and 3 bed dwellings, with a total of 59 bedrooms, and parking spaces for 28 cars behind the block, accessed via an entrance mid-building. The architects were seeking local reactions, willing to listen and seemingly willing to consider adjusting designs. What stood out immediately was the size and style of the proposed building, which is uncompromisingly rectangular, vertical, and flat roofed — no gables, no eaves — unlike other buildings in the area. Its central section would be four storeys tall, stepping down to two storeys where it adjoins existing Beales Lane houses. The bulk of the proposed building would be much closer to the road in Beales Lane than is the case with St Catherine’s House, although the section nearest Thames Street would be set back to accommodate the existing tree. The consultation and exhibition were organised by Harper Planning, on behalf of PA Housing. The design team spoke with interested members of the local community, answered questions and discussed concerns. PA Housing, owners of the site, intend to apply for planning consent to construct a mix of one, two and three bedroom apartments, following demolition of the current buildings. There would be a mix of private ownership, shared ownership and social housing. We have heard strongly expressed views that the design does not fit with the local street scene and is oppressively massive. It would loom over Beales Lane. Most local buildings are brick built two storey dwellings with traditional pitched roofs, many with relatively low eaves. Beales Lane leads into historic and diminutive Church Walk. Parking will be a very sensitive issue in an area with extremely limited on-street parking. More flats and private/shared ownership mean many additional residents are likely to have cars. 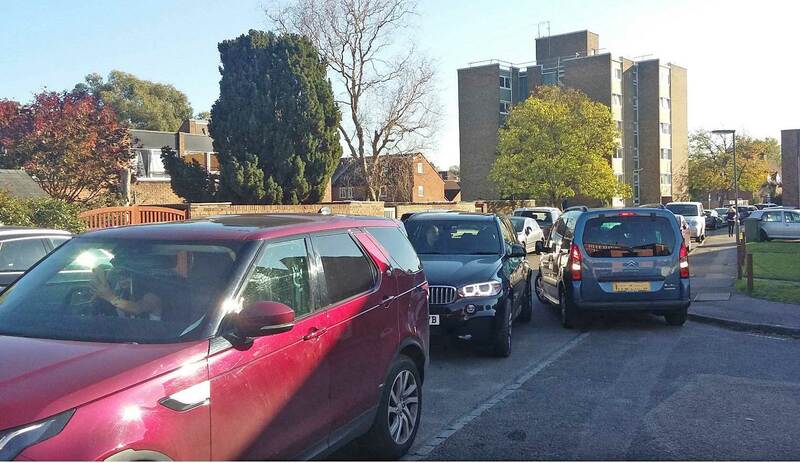 Some residents in neighbouring Church Walk, Jessamy Road and Thames Street, where parking space is at a premium, have to resort to finding a parking space in Beales Lane when needed. There are also concerns about the loss of the paved space at the front of St Catherine’s which is currently used by many vehicles for turning, as Beales lane is a cul-de-sac without a turning space at the end. We hope local views will sway the architects (contactable via info@harperplanning.co.uk) and that any planning application will reflect local reaction. 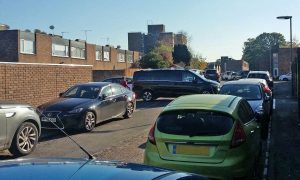 Residents of Grenside Road face school traffic and parking issues which need help from Surrey Highways. Grenside Road is a cul de sac with no turning space, so things can get fraught when large numbers of parents park up on the pavement and neighbouring land, wait with engines running, then try to turn around and drive out. The private access to residents’ parking spaces and lock up garages is often obstructed by parents parking and manoeuvring and trying to turn around to depart from Grenside Road. The school’s use of the Grenside Road gates as a secondary entrance is in line with Surrey’s policy of multiple access points. But the road lacks the parking controls expected around a school entrance. There are still no zigzags or special parking restrictions around this entrance, despite the optimistic comments made by an outgoing councillor, before last year’s Surrey County County local elections, about Surrey making safety improvements in Grenside Road. 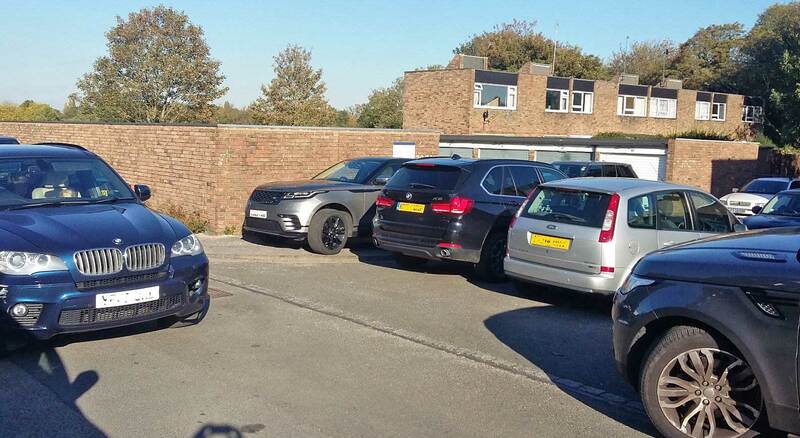 St George’s Junior School is trying to make sure parents are considerate, but official parking restrictions from Surrey would allow traffic wardens to enforce better behaviour. PPDRA will continue to draw this to the attention of the new County Councillor, Tim Oliver. Action is needed to improve a situation residents find unacceptable. Here is the latest CCG update about consultation on local urgent health care provision, following the Weybridge Hospital fire. The aim is to establish what NW Surrey needs for urgent care, given that Weybridge Walk In Centre no longer exists. Meetings are in Staines, Woking & Weybridge. Subject: EVENT INVITATION: NHS workshop for Weybridge residents – what’s important to you when you need care urgently? What’s important to you when you need care urgently? If you live in North West Surrey you are invited to an interactive workshop to discuss how urgent care services could be improved for you. Local health and care organisations want to hear your thoughts and experiences to help shape future services. These events are part of The Big Picture – an opportunity for local people to join an open and honest discussion about the future of care delivered outside of hospital. Once we have clearer plans for urgent care services across North West Surrey, we will be better placed to determine the services that will eventually go into the new healthcare facility at the Weybridge hospital site. As part of our future engagement plans we will want to work more closely with the local community around the new facility – this will include setting up dedicated group to consider services and the look and feel/design for the new building. Background – what’s this about? The majority of health and care support happens outside our main hospitals and we know the system isn’t working as well as it could. Increased demand from a growing population, the changing needs of people living with long-term conditions such as diabetes and heart disease, and continual difficulties in recruiting the right staff are all putting pressure on our health and care system. We have published a case for change – full version and summary version and produced a short film. These explain why change is needed and the emerging thinking around how we can support people to stay well for longer and reduce the burden on urgent and emergency services. We are also thinking about how we support NHS England’s recently published standards for Urgent Treatment Centres – this is the new name being given to all walk-in facilities such as Urgent Care Centres and Walk-in Centres which will improve and standardise how these services are provided. Please help us by sharing this information with your networks. You can also follow the conversation on Twitter and Facebook #BigPictureNWS. Thank you for your continued support with involving local people in shaping the future of their health and care services. Do you know of a worthy community project in need of funding? Elmbridge Borough Council has this week announced that they are now open for applications for CIL funding for 2019. Expressions of interest are invited from projects which may qualify. Funding criteria cover a broad range of initiatives which benefit the community. It is a matter of meeting the criteria, presenting a good case, and getting the application in on time (there is a history of worthy projects missing the deadline!). Applications close on 21 October 2018. Elmbridge Borough Council is currently inviting applications for funding from the Community Infrastructure Levy (CIL). CIL allows the Council to raise funds from some forms of new development to help fund the physical infrastructure needed to mitigate the impacts of new development. The bulk of the money raised goes towards strategic borough wide schemes such as highway schemes, permanent school expansions or flood works. However, as part of the process, the Council also allocates a portion of these funds to be spent locally on smaller infrastructure schemes that are required in the communities where development took place. The Council has formed settlement area committees known as Local Infrastructure Spending Boards where local Councillors will decide on how these local CIL funds will be allocated. In the case of Claygate, the local proportion of CIL funds will be passed directly to the Parish Council. Successful local CIL applications for funding to date have included projects such as capital improvements to state schools to better enable them to meet the needs of an increasing school population, improvements to community facilities, footpath works and countryside access improvements. Read more on the Elmbridge website. Traffic and Parking – What do YOU want done? Remember Surrey’s 2009 North Weybridge parking proposal? Many residents objected strongly, with good reason. It proposed CPZ restrictions that would have made life difficult in some roads. The plan was scrapped, and other roads that needed parking controls had to wait. Conclusion? CPZ proposals must be designed to meet the very different local needs of different roads. Our part of Weybridge has traffic and parking issues which vary considerably from road to road. We have several roads used as rat runs, three schools, roads where residents have no off-street parking and others with ample off-street parking. Previous attempts at strategic parking solutions have failed because they ignored local residents’ differing needs. Can we do better now? Greater disturbance for residents from noise and fumes. Positive effects when considerately parked cars reduce excessive traffic speed (natural traffic calming). Don’t use strategic planning as an excuse for inaction: where there is an urgent need, action must be urgent. Here we give some more background on local issues for residents around traffic and parking, and their impact. Local views on traffic are reasonably clear — most residents don’t want dangerous rat run traffic in their residential roads — but parking is more divisive. One resident’s solution may be another resident’s problem. PPDRA’s long held view on parking is that local residents are the people who know most about the parking needs and issues in their road and nearby. Residents are the people who have to live with the issues day after day, so their views should be heard. Of course restrictions must be strategically coordinated across the area, but that must not disadvantage roads in urgent need. 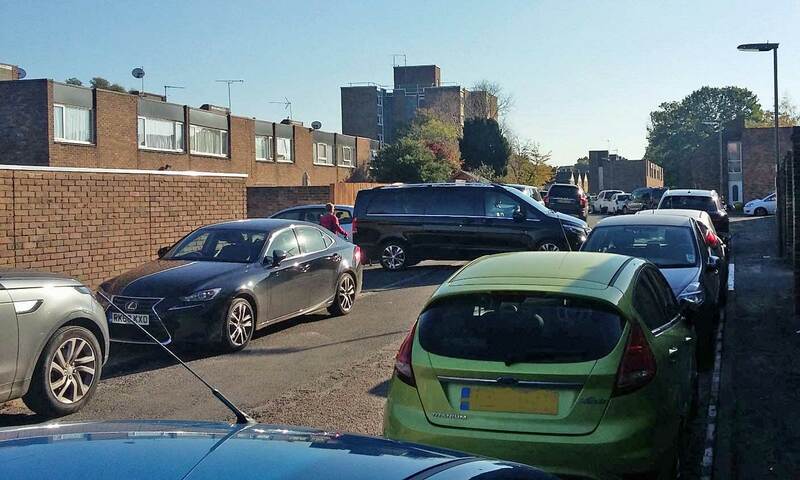 Residents who have to rely on finding an on-street parking space have the greatest need — so PPDRA has long supported residents’ majority calls for controlled parking zones (CPZs) in roads like Elmgrove Road (given a residents-only CPZ) and Dorchester Road (still waiting). Areas around schools also have particular needs. For example, we have been lobbying for safety improvements in Grotto Road and Grenside Road. Currently it is suggested that a large area of Weybridge could be made a CPZ, perhaps with inner and outer zones (see the Weybridge Parking Project). Some local residents — including most of the PPDRA committee — were worried by proposals in the original Parking Project report, because they seemed to ignore considerations that some residents feel are local priorities. Happily, the Weybridge Parking Project team appear to be evolving the proposals in response to concerns. One resident said, after reading the report, “I don’t want to see our town ringed by multi-storey car parks and dominated by yellow lines, clearing the way for faster rat run traffic”. Other residents (e.g. in Radnor and Glencoe) are aware that a CPZ in their road would significantly reduce their ability to find anywhere to park, because of all the additional yellow lines (see the 2009 plan above). Reduced capacity, greater rat run danger and increased inconvenience were key reasons behind residents’ overwhelming rejection a proposed 2009 North Weybridge CPZ (see plan above). The proposal to ban daytime parking on Portmore Park Road was especially unpopular. It would have encouraged rat run traffic, reduced parking options for residents of nearby roads, and caused problems for parents collecting children from St Charles Borromeo. There were also worries of impact outside the proposed CPZ boundary, in Thames Street and beyond. So what factors must be considered now, and what principles would bring the best outcome? The Local Priorities listed above by PPDRA draw on years of input from local residents. At its heart, our position is that any strategic parking solution must reflect the differing needs of different roads. Our part of north Weybridge has some very specific parking and traffic issues, which vary enormously across the area. We have many attractive narrow fronted Edwardian and Victorian homes within walking distance of the town centre, busy schools, local businesses, tree-lined suburban boulevards with large houses, and traffic trying to avoid main road jams. Many residents have long believed that strategic action is needed, with the councils working together. Surrey County Council is responsible for controlling on-street parking, Elmbridge for off-street. A strategic approach to parking and traffic issues will only succeed if it addresses the different issues facing different roads in north Weybridge. It must be sensitive to local priorities and the different needs of different roads. Strategic solutions are difficult, which means they take time. Hence many residents are disturbed at suggestions that urgently needed local changes should be put on hold pending an overall strategic solution. It should perfectly possible to agree more immediate local changes, in line with an overall strategic vision, to relieve severe problems. There is a cost to local residents in failing to meet their needs! We have added a further clarification from Pauline O’Sullivan on CPZ proposals from the Weybridge Parking Project, which illustrates how the Project is being responsive to local concerns. We are currently distributing our latest Portmore Park & District Residents Association newsletter and membership form. PPDRA volunteers are delivering 1200 copies, to households in the roads we cover. We are a non-political, voluntary association of residents in north Weybridge who care about local quality of life, community and heritage. Open to all local residents. Newsletters, community meetings, website, and more! INTRODUCTION: We are grateful to PPDRA committee member Pauline O’Sullivan for this informative overview of the Weybridge Parking Project — work in progress by the Weybridge Society and Weybridge Town Business Group, a major undertaking on a significant topic. parking restrictions must not increase rat run traffic through residential roads. These are two concerns which local residents frequently express to PPDRA, which were included in our evidence to the project, not apparent in the original Parking Project report. We welcome the prospect of the Parking Project accommodating these and other wider concerns. PPDRA strongly supports the principle of a strategic plan recognising the diverse parking needs across our local community. We also feel it is important that it covers traffic as well as parking, as the two are so interrelated. Creative thinking is at last taking place to sort out parking and improve our Town. There are many factors involved and your input and ideas are important. SCC and EBC have failed for years to implement an effective and cohesive parking plan for Weybridge that addresses increasing problems for business, shoppers, residents, schools and visitors. Getting this right is fundamental to the prosperity, look and feel of our Town. The project involved only: the collection of hard data on the extra commuter parking space needed, the assessment of space available in existing car parks and their potential for expansion, and current charges/revenues. It also looked at current problems and considerations relating to the parking needs of all users and identified further work necessary to assess the wider impacts to be considered before any final solution can be proposed and implemented. A comprehensive survey of local businesses revealed that a minimum of 725 commuter cars currently park each weekday on the streets around Weybridge High Street and the Queens Road Village. They make parking difficult for shoppers, visitors and residents, especially for those with no off-street parking. The solution being suggested is to provide more off-street parking for use by commuters and the creation of at least two Controlled Parking Zones (CPZs) for residents that can be shared with short and medium-term shoppers and other visitors. The precise details of these CPZs are still to be decided and are likely to be shaped more in line with the official town boundary to take better account of the inconvenience suffered by residents in roads close to retail areas. Note these will not be concentric circles as used in the Proposal as indicative of distances from a central point. In February, the WS and WTBG met with Weybridge and Surrey councillors to launch the Review and Proposal. Agreement was gained for it to be presented for adoption at the next Joint Executive Group of SCC and EBC. Cllr. Andrew Davis agreed to undertake the Feasibility Study into the potential expansion of existing car parks, acknowledging the need for creative ideas and no multi-storey eyesores. This was due to be delivered at end of June, but a lack of progress has meant that it is having to be recommissioned. Feasibility Study into possible car park expansion to ease parking pressure in the two main retail areas and around the station. Continued discussion on additional parking being provided as part of redeveloping the hospital site. 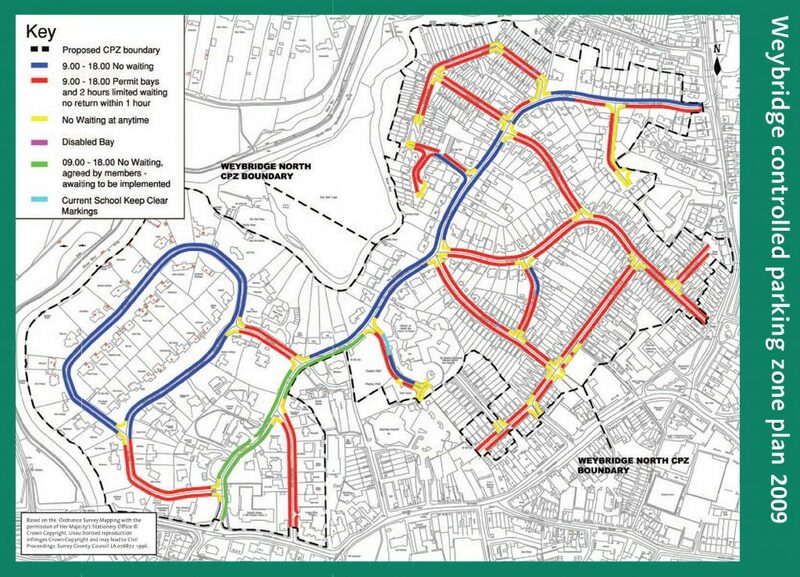 Traffic Management Review – volumes, flow, pollution levels, safety and potential impact of changes to parking and restrictions in residential roads. Quantify parking needs around schools at drop-off and pick-up times. Quantify the impact of evening parking needs on residents. Investigate new parking opportunities and the further parking potential that could arise from changes being considered to the town layout. Further Investigate the viability of a Park & Ride scheme from Brooklands. Quantify the charging, economic viability and use of extended of car parks with the focus on their use by long-term parkers. It must not disadvantage residents in roads with limited or no off-street parking, nor increase rat runs. Businesses must buy into their staff using carparks and the cost implications. Residents must buy into paying for parking permits in return for local parking and having controlled parking zones to ensure that long-term parkers use car parks. The timetable for implementing any new Parking Plan must ensure that adequate off-street space is available prior to introducing any more CPZs. No further money should be spent on existing carparks until their future has been decided. WHAT DO YOU THINK? HAS SOMETHING BEEN MISSED? Contribute your thoughts below, and come to the PPDRA AGM on 13 September to share views and hear from councillors. THIS IS IMPORTANT. Here is some further helpful clarification from Pauline O’Sullivan on CPZ proposals from the Weybridge Parking Project, which illustrates how the Project is responding to local concerns. Comments invited. 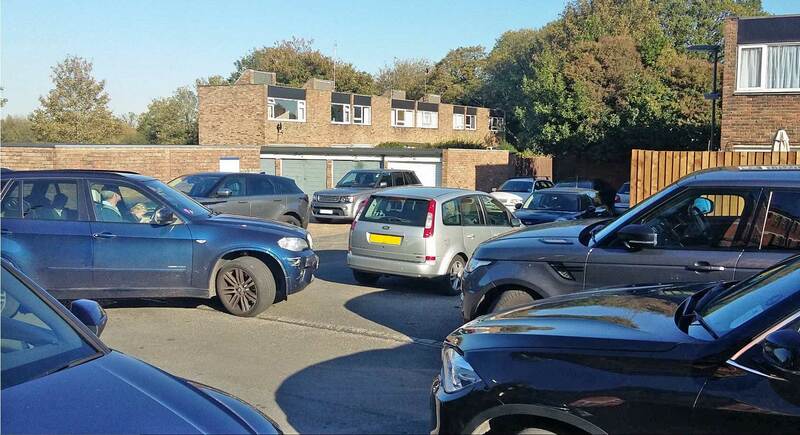 It is generally accepted that Weybridge needs more off-street space for long-term parking so that all residents can park close to their own homes. However, there is also a need to provide an element of short-term parking for shoppers and visitors within walking distance of the High Street and Queens Road trading areas. Getting this balance right is not going to be easy, with many factors to be considered. The enlargement and changes of restrictions to the existing CPZ in 2015 resulted in more stress in adjoining roads, a reduction in parking for shoppers, and roads in the CPZ being left with lots of space for much of the day. A revised approach is therefore essential. 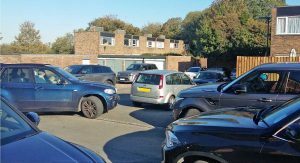 The Weybridge Society website (weybridgesociety.org.uk) gives full details of its recent Parking Project that quantified both the cause of the congestion (long-term commuter parking) and the needs of residents, shoppers and businesses. The Project concluded that there will have to be more controlled parking on our roads for off-street parking to work. The current thinking of the Project is to have 2 CPZs, one broadly following the irregular shape of the official Town centre boundary and a similar one for Queens Road, both based on the acceptable average walking distances for commuters as determined by the Weybridge Society’s survey. Differing parking restrictions would need to apply within these CPZs to reflect the proximity to the High Street and Queens Road, and the needs of individual roads and locations, e.g. around schools. It is already recognised that a few roads may opt to be excluded from any restriction for practical and/or safety reasons, so getting the best result for all will be a complex process. Understanding the views of residents is therefore very important.